Hello true believers and lovers of art. We continue to replenish the category called “Comics” on our website. 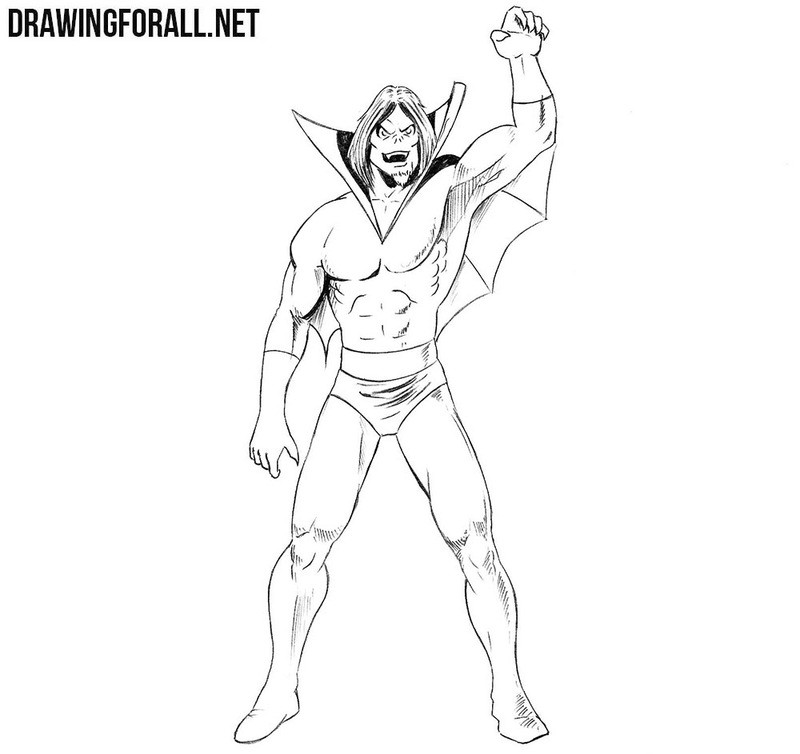 In this lesson we will talk about how to draw Morbius from Marvel Universe. 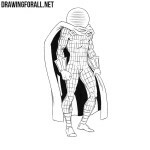 First of all we sketch out the head in the form of a simple oval (it will be the head of our character). Under this oval draw a long line – this will be the neck and spine of Morbius. On this line sketch out the thorax and pelvis. 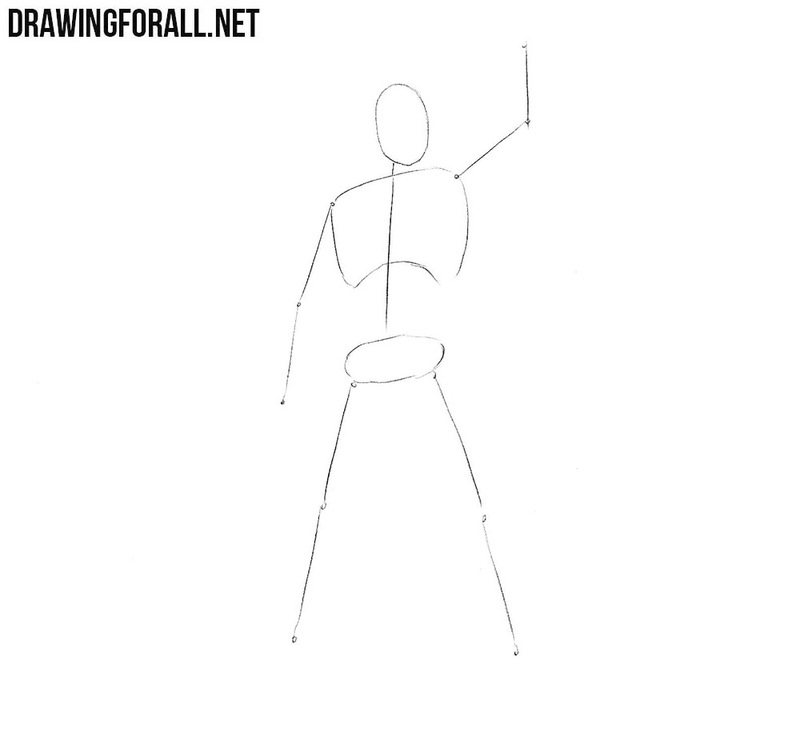 Using simple lines sketch out the arms and legs. In this step we will work with the volume and add flesh to the body of Morbius. Sketch out the neck in the form of a cylinder. Next, outline the torso, which widens in the shoulders and tapers at the waist. Sketch out the arms and legs with the help of cylinders and circles, as it is shown in the picture below this text. Now let’s work with the final details. On the horizontal line from the previous step draw large eyes with frowning brows. Then right under the eyes draw out a high upturned nose and an open mouth with sharp fangs. We continue drawing the head in detail. Carefully draw out the outlines of the hair. Next, draw out the outlines of the jaw and a small beard on the chin. Also do not forget to draw out a couple of wrinkles on the face and lines of cheekbones. Now draw out a high collar (similar to a collar of Count Dracula). 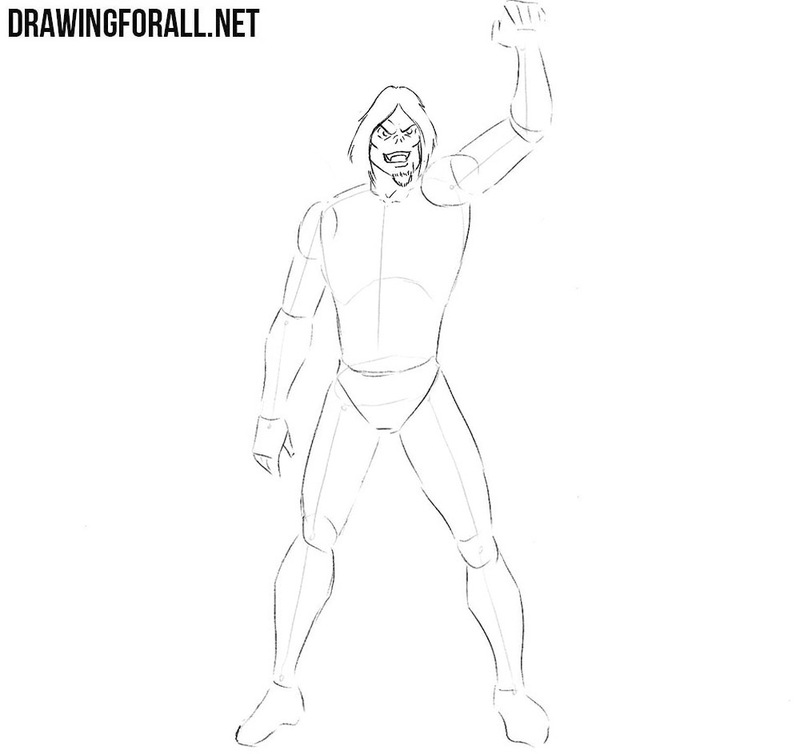 Next, draw out the outlines of the broad pectoral muscles and cubes of the abdominal muscles. 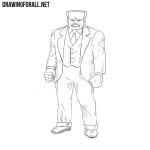 Draw out the outlines of the torso and remove all unnecessary lines from it. Now let’s move on to the arms of Morbius. 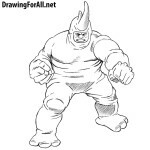 Carefully draw out the outlines of large deltoid muscles. 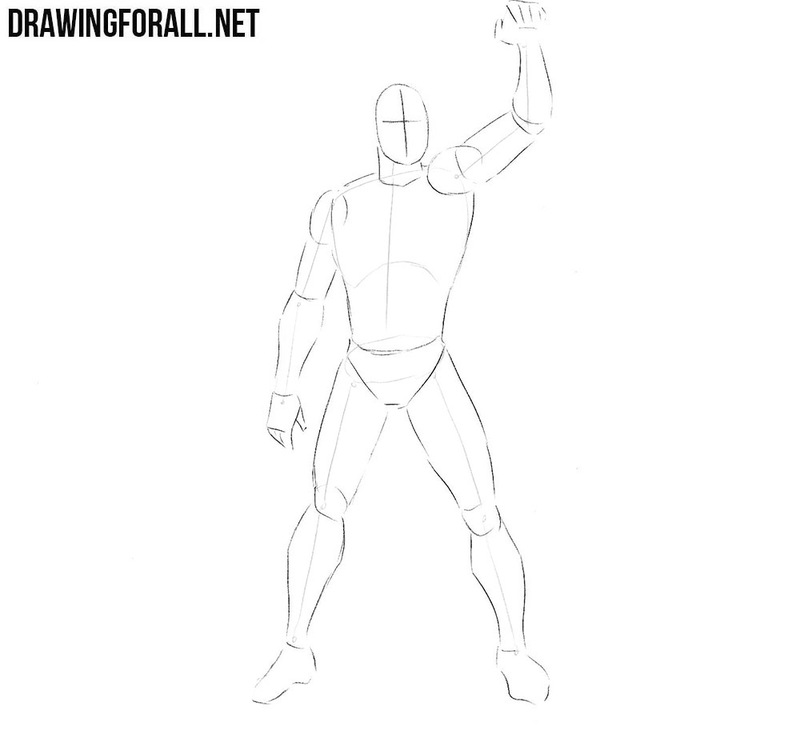 Now draw out the biceps, triceps and muscles of the forearm. 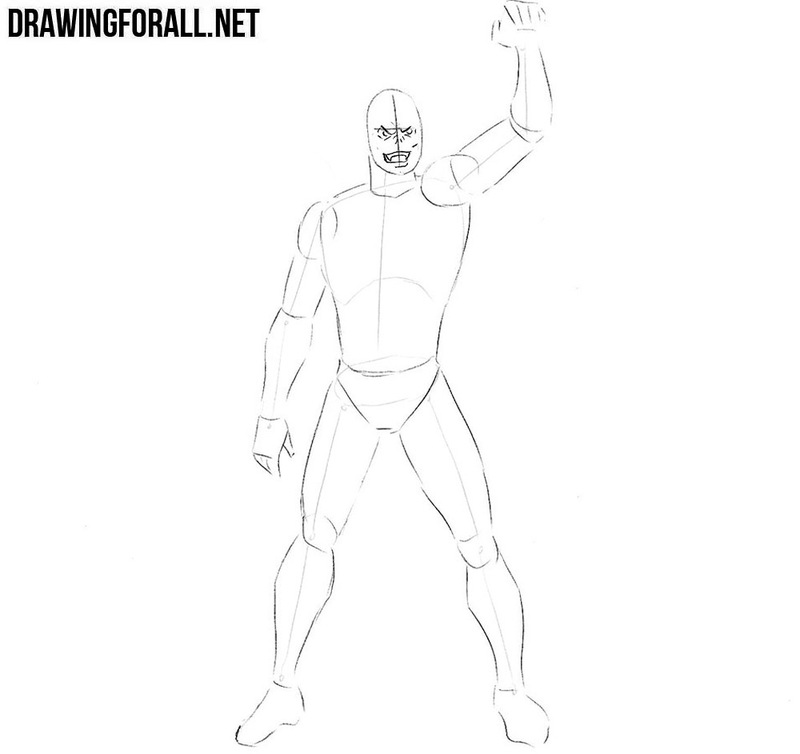 To learn more about hands, visit the lesson on how to draw hands on our website. In this same step draw the webbed bat wings in the armpits. 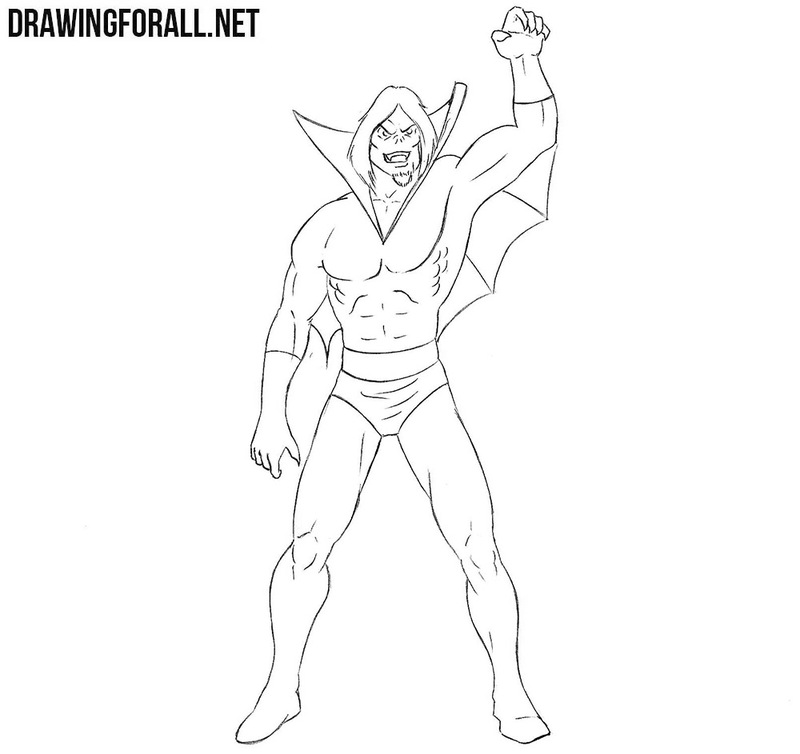 Now we need to draw the lower part of Morbius body. Continuing the lines of the torso draw the belt and the pelvis. Further draw out the outlines of quadriceps, knees and calf muscles on the legs. 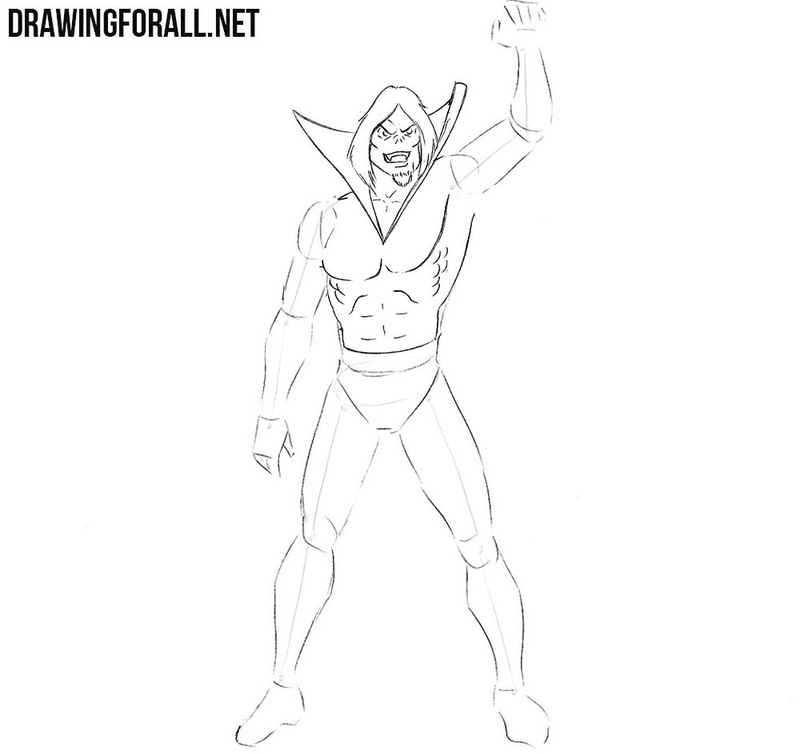 Add some folds to the shorts and erase all remaining unnecessary guidelines from the body. Now we need to draw shadows. In this lesson, as you can see, we applied two kinds of shadows, as do the comic artists. The darkest areas will be shaded with the help of clear and dark parts of shadows, and the lighter shadows will be drawn with the help of dense hatching. 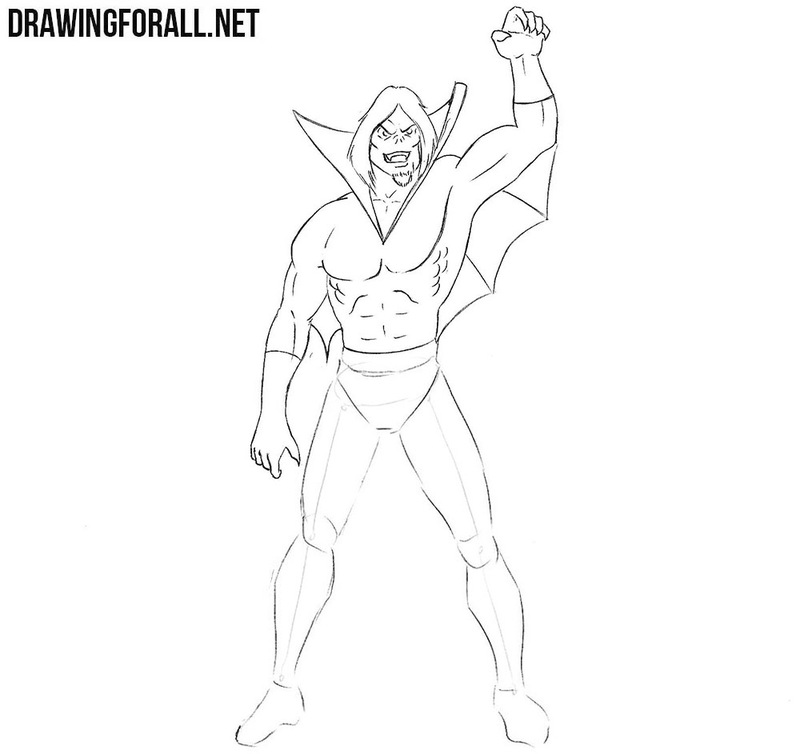 In this cool lesson we showed you how to draw Morbius from Marvel Universe. At the end of the lesson we want to give you some advice that will be useful in our opinion. The first two steps should be drawn using very light, almost transparent lines, but from the third step you need to use darker lines or use ink (as do comic artists). 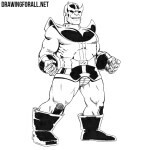 If you want to learn more about how to draw a human body (in particular the body of a superhero), then visit the lesson on how to draw Dr. Manhattan.